The right show at the right time in the right place can work quiet wonders. 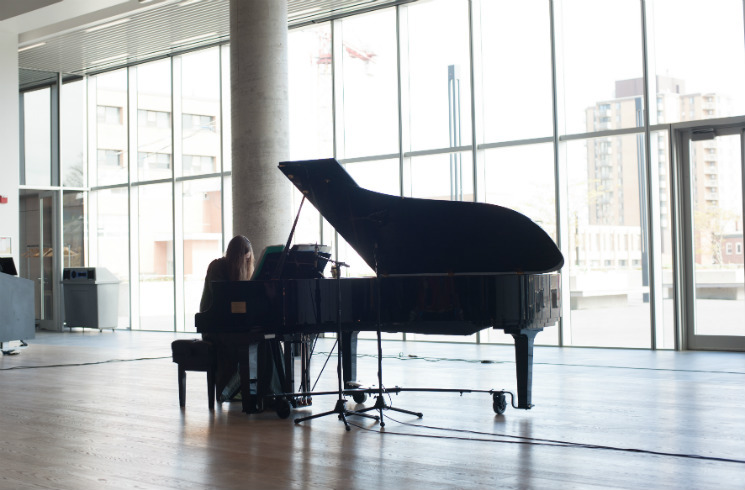 In this case, it was Montreal's Kara-Lis Coverdale performing a suite of solo piano compositions called PICL (Pieces in Caps Lock) in the bright and open space of Paul O'Regan Hall in the Halifax Central Library. Coming on the last afternoon (May 28) of the brain-bending experience that was the OBEY Convention, her long-form, interlocking series of melodically diverse works blanketed the gathered crowd in a meditative serenity that seemed earned and needed. Playing in front of a wide backdrop of floor-to-ceiling windows looking out onto the library's back courtyard, notably on the first partially sunny day of the cold and rainy weekend, Coverdale unexpectedly shared the spotlight with a series of toddlers running, climbing and jumping off the concrete structures and backpacked passersby enraptured by their cell phones, oblivious to the spell she was casting inside. Played in one long, uninterrupted flow, the compositions had a feel of timelessness and familiarity occasionally punctuated by mildly jarring repetitions or very brief dissonance to give the beauty some counterpoint. Stretching the performance out to 90 minutes perhaps thinned the experience a little, but the recharging and calming effect was much appreciated.